Fully compatible with the Shandon CytoSpin® Centrifuge, these CytoSep™ Cytology Funnels can be used to deposit a thin layer of cells in a clearly defined area of a microscope slide. The filter card absorbs any access fluid. They have the filter cards pre-attached for consistent, reliable results. No alignment necessary. 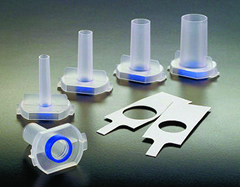 All disposable funnels are packaged with closure caps to seal in specimen for added protection. All components are also available separately. 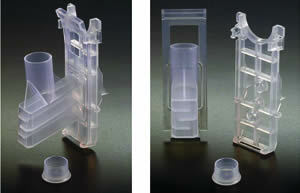 For sample volumes of up to 0.5 ml, use the Single CytoSep™ Cytology Funnel with a White Filter Card & Cap. It provides a cell deposition area of 6 mm (28 mm squares) and allows one sample to be run simultaneously on a single slide. It is not necessary to use a different stainless steel slide clip. 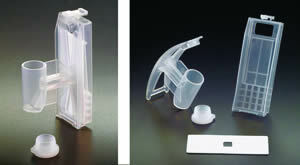 For sample volumes of up to 0.4 ml, such as spinal Fluids, use the Single CytoSep™ Cytology Funnel with Brown Filter Card & Cap. It allows for a slower absorption of fluids. All the individual components are also available separately. 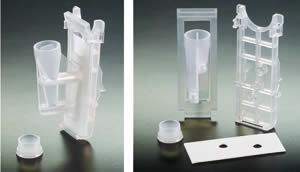 This double CytoSep™ Cytology Funnel with disposable sample chamber allows for two samples to be run simultaneously on a single slide and is ideal for immunohistochemistry work. The Double CytoSep™ Cytology Funnels provides a cell deposition area of 6 mm (28mm squared) for sample volumes of up to 0.5 ml. The filter card come pre attached. Cap is included. No need to use a different stainless steel slide clip. Components are also available separately. These are so easy to use, and improve turn-around time while giving more diagnostic information. Being totally disposable, they eliminate time consuming decontamination and cleaning. They are safe to use and reduce the risk of exposure to pathologic samples. They also decrease the possibility of cross-contamination. This series of CytoSep™ Funnels is single-use. The disposable sample chambers do not need metal clips and are designed to meet any processing equipment. They are capable producing high quality thin-layer slide preparation while improving laboratory efficiency. The disposable Sample Chambers with white Filter Cards are used for sample volumes up to 0.5 ml, the ones with the Brown Filter Cards are for sample volumes up to 0.4 ml. The cell deposition area is 6 mm diameter (28 mm squared). Filter Cards are pre-attached> Excellent for scanty specimens such as CSF. All components are also available separately. This ALL PLASTIC CytoSep™ MEGA Funnel provides an easy, efficient and cost effective method of producing high quality thin-layer slide preparations. It eliminates the needs for stainless steel clips. It is ideally for preparation of large volume samples. The larger funnel is quick and easy to remove. The large rectangular cell deposition area of 22 x 14.75 mm (325 mm squared) provides for up to 12 times the sample volume (6 ml) of the single Cyto™ Cytology Funnel. Strategically placed baffles inhibit cell setting which results in uniform cell deposition and excellent quality slide preparations. 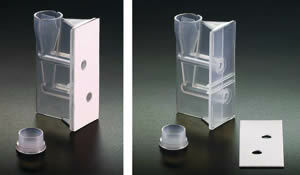 This MEGA funnels and cap minimize user exposure to pathogens while reducing the risk of specimen cross contamination. Can prepared both air dried and fixed preparations. The CytoSep™ Funnel Chambers for the Hettich Cyto-System optimize lab throughput with multiple funnel options in 2, 3 or 4 funnels per slide. These funnels are perfect for every application such as CSF, Viral infections, Bronchial secretions and come in four sizes from 1 ml to 8 ml. The 1 ml chamber is for small-volume samples of low cell contents. Both 2 and 4 ml chambers are suggested for cell-rich samples, e.g. pleura, ascites and bronchial washing while the 8 ml chamber is perfect for large volume samples such as urine.